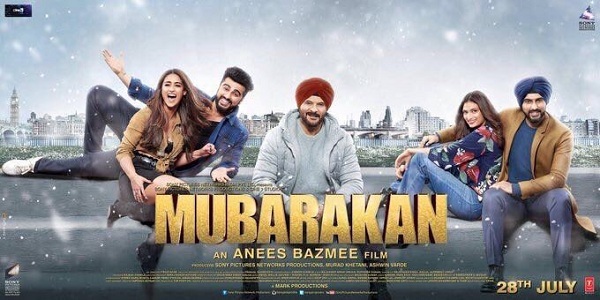 Mubarakan 3rd Friday (15th Day) Collection Report. Mubarakan has shown significant drop on 3rd Friday (15th day) and started slow for 3rd week. Story was same for 2nd Week also, as film started slow on 2nd Friday. However, film picked up hugely through the weekend and remained solid through weekdays. Hope film shows similar trending in 3rd week also. Mubarakan has collected an approx 50 lakh nett on day 15. Film registered a 50% drop in collection from 2nd Thursday. Since, word of mouth of Mubarakan is positive, it will show jump on 3rd Saturday and 3rd Sunday. Ideally film needs big push on these two above mentioned days to put up a healthy 3rd weekend total. Mubarkan total collection at the end of 15 days is approx 48.75 crore nett. Film will cross 50 crore nett inside 3rd weekend. Film lifetime collection is heading towards 55 crore nett. But that is not enough as film needs to close on 60 crore nett mark. Hope film shows tremendous fight back again in this week. 2nd Week - 12.6 crore nett. 3rd Friday - 0.5 crore nett (est).